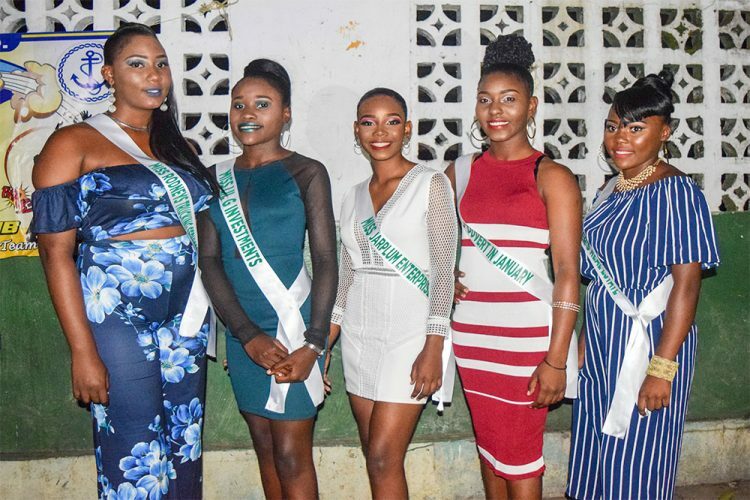 Five delegates Z’annie Charles- Miss Rodney’s Trucking Services; Suesha Haywood – Miss Lil G Investments, Stephanique Ince – Miss Jarplum Investments, along with Kendra Joseph – Miss J’ouvert in January and Zarina Woods – Miss Caesar’s Real Estate, will vie for the title of Miss Claus 2018. Set for the night of December 25, at the Greiggs hard court, the five will appear in Christmas wear, sports wear and evening wear, as well as perform a talent and be engaged in an interview segment. The show will be held under the theme: “Style is our fashion, Beauty is our culture, Equity is our value”. Miss Claus, which had its first show in 2017, is organized by the Sea Operations Nar Fren Dem Sports Club. Last year’s first winner was K’tonya Peters.